Do you want to be a PADI Divemaster? You can go from any certification of diver, even with no diving certification, to the Advanced levels of a PADI Dive Pro. The PADI Divemaster Internship is the ideal package for people like you that want to give a total change to their lifestyle on a budget! The PADI Divemaster internship is a comprehensive training program designed to develop the skills required to become a PADI Dive Professional. You can join the PADI Divemaster internship at any stage in your diving career, but if you have no certification it is with a minimum training period of 6 weeks. You’ll start with the PADI Divemaster course, a program where you will learn to guide experienced divers during the exploration of the underwater world, and also to assist students in training under the supervision of an instructor. During the PADI Divemaster program you will learn a lot more about the Dive Theory which will cover subjects like; Physic, Physiology, Equipment, Use of the RDP Table version and the eRDP, and General Skills. During our PADI Divemaster internship our program allows plenty of time to log lots of dives, with a minimum of 60, and anywhere up to 100 dives. Interacting with other student’s on courses gives you that hand’s on experience that will guarantee you the proper understanding of the duties and responsibilities involved in being a PADI Divemaster and allowing you to log lot’s of dives. We were the first Dive Centre in the Canary Islands to have been awarded the PADI Green Star award. We were the first Dive Centre in Tenerife to have received the 100% Project AWARE award. Our IDC Dive Centre is authorised to train up to PADI Instructor level. We are (Officially according to PADI) the number 1 PADI Dive centre in the area ( 2009 / 2010 / 2011 / 2012 / 2013 / 2014 / 2015 / 2016 / 2017) and have certified more PADI Divemasters than any other Dive Centre in Europe. Our Dive centre is the longest running dive centre locally and has become synonymous with quality of service amongst divers of all levels. Our training options are second to none and with the huge knowledge we have built we will take you through all the challenges of training and show you how to become the best PADI Divemaster possible. Once qualified we can help you to find employment or continue your diving education up to Instructor level and beyond. We offer the best options to make the internship more affordable for you, but not “on the cheap”! A genuine working experience to get you ready for the duties of a PADI Divemaster. The opportunity to dive with other Divemasters on your own FUN dives. 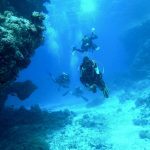 You can extend your stay with us for as long a period as you wish to gain even more experience and get more FREE dives. With 2 PADI Master Instructor’s, PADI Staff Instructors and PADI Divemasters on hand to help you every step of the way. Additional Professional Diving Internships / courses available to make you a valuable employee.